I am a doula on YOUR side- whatever your choices, whatever your values- I’m there to serve you and your family during this exciting and precious time! Yes- your OB and Perinatologist know that doulas have a positive, clinical impact on your labor and delivery! Statistics like these show the quantifiable benefits of doulas- but there are important emotional benefits as well. Families who hire doulas report feeling safer, more informed and better heard during their birth experiences. And partners LOVE doulas! I help your partner understand how to best support you during labor, delivery and after your baby is born. I give your birth team emotional and practical support as well, helping them find time to eat, rest and be as involved with the birth of your baby as you desire. I also assist in prenatal birth-visioning. This is where you and I work together to discover what kind of birth experience is important to you and then we think of ways to help you meet your birth goals. 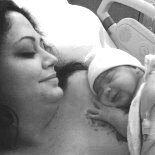 Visit this blog post that describes more about my view of doula service and check out come testimonials here! assistance with your first breastfeeding session if applicable. **There are some reports of families being reimbursed for doula care by the insurance companies after the baby’s birth. I am happy to help you pursue this option. Payment would be made in full and I will provide you with a coded receipt and sample reimbursement request letter. There is no guarantee of reimbursement, but it may be a possibility worth pursuing! Need more ideas about how to pay for a doula? Check out this link!